Historic Topeka Cemetery is a setting unlike any other in Topeka. The grounds offer an eternal view for those who shaped Topeka and Kansas from territorial days into the 21st century. The city skyline, with the Statehouse standing prominently in the center, can be seen from nearly every part of Topeka Cemetery. Over its 160 years, Topeka Cemetery has become the final resting place of more than 35,000 souls, including many founders of the city and state, those forward thinkers who worked to make Topeka the state capital, who built a university, who brought prosperity to the plains with railroads and manufacturing. Their descendants have taken those legacies and continue to work to make Topeka prosper. From its chartering in 1859, Topeka Cemetery has welcomed all. Designed as a non-profit, all proceeds have gone back into the care and improvement of the grounds. The Crane family directed cemetery operations for the first 100 years with the assistance of a board of directors. Today, the cemetery belongs to the people who own spaces – who collectively are the Topeka Cemetery Association. A volunteer board of directors from this body runs cemetery operations. Funds for operations come from three main sources: sales, a stipend from the City of Topeka, and interest from the perpetual care fund, which is held in trust at Kaw Valley Bank. 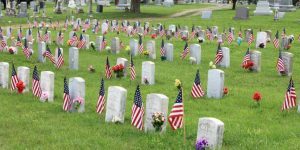 The city contribution helps ensure continued private operation; if the cemetery was to default, the city would be required by state law to take ownership. Historic Topeka Cemetery’s caretakers remain committed to respectful maintenance and preserving memories for generations to come. Topeka Cemetery has many friends who help care for our 80 acres and 35,000 gravesites. The Sons of Union Veterans help maintain the Civil War section and also clean and straighten headstones of Civil War veterans throughout the cemetery. Keep America Beautiful/Topeka-Shawnee County brings a large group out each May to get the cemetery looking its best before the Memorial Day weekend. Westar’s Green Team helps many with removal of trees too large for our two-person crew to handle. Eagle Scout projects have included fixing up areas around the house and raising gravestones that have sunk over the years. Not everyone can provide hands-on help. Monetary donations have allowed Topeka Cemetery to take on some large projects, including this website. At a 160-year-old homestead, something always needs fixing. If you have skills and would like to see how they could be put to use, whether in maintaining buildings and grounds or helping with records and research, please call us at (785) 233-4132. Monetary donations also are gratefully accepted, and all donations are 100 percent tax deductible. The board consists of members of the Topeka Cemetery Association, which includes all those who own lots (burial spaces) in Topeka Cemetery. Lot owners may share general concerns at the association’s annual meeting each spring. All are welcome to contact the office or any board member with questions about policy and practices. The board meets once a month, except for December. If you have an interest in being a member of the board, find out more by calling the office at (785) 233-4132 or board President Chris Hutton.